Infrared Bearded Iris | Gurney's Seed & Nursery Co.
A Dramatic Color with a Graceful Form! The bold red of this striking iris is the perfect color to make an eye-popping focal point or fresh arrangement. Plant them in groups of three or five, alone or alongside lighter, brighter blooms to give your landscape a professionally designed look. Ruffled irises of deep maroon feature bright yellow beards and a classic ruffled form. Flowers appear by the dozens during mid to late springon tall, 35-37" stems that stay upright in heavy rains and high winds. Reliably resistant to a range of diseases including leaf spot and crown rot, as well as garden pests like borers, aphids and wood lice. Very easy to maintain, too. Simply remove spent flower heads to promote more blooms. Hardy in Zones 4-9. FoliageGlaucous-green sword-like fans of stiff upright leaves with some dying back in colder climates in winter. Flower FormFlowers are fan-shaped, with three drooping petals called falls and three upright petals called standards. Ruffled. ColorDeep maroon with bright yellow beards. PruningRemove spent flower stems after blooming. In late fall, cut back foliage to 6 inch fans. Clean plant debris before winter to prevent borers overwintering. CommentsThe bold red of this striking iris is the perfect color to make an eye-popping focal point or fresh arrangement. Plant them in groups of three or five, alone or alongside lighter, brighter blooms to give your landscape a professionally designed look. 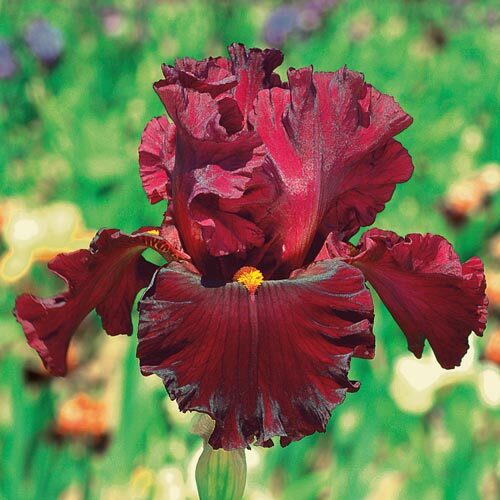 Ruffled irises of deep maroon feature bright yellow beards and a classic ruffled form. Flowers appear by the dozens during mid to late springon tall, 35-37" stems that stay upright in heavy rains and high winds. Reliably resistant to a range of diseases including leaf spot and crown rot, as well as garden pests like borers, aphids and wood lice. Very easy to maintain, too. Simply remove spent flower heads to promote more blooms. 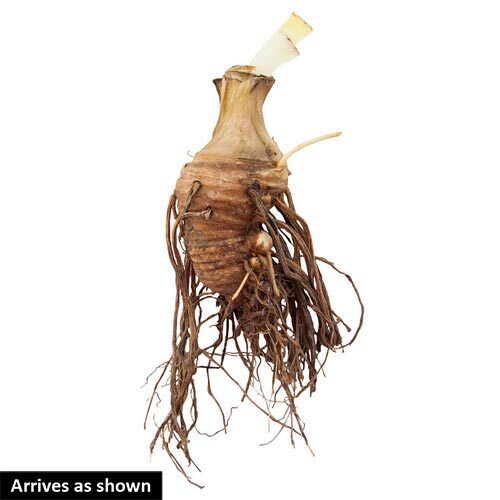 DepthSet rhizome so bottom half is below ground level. Firm well and water thoroughly.